A scarce c. 1880 restrike of the lost 1550 Tapisserie Plan, the second earliest plan of Paris. Paris De 1512-1547 de la Gran Gouache apres le plan Tapisserie. An uncommon find, this is Charles Chardon's c. 1880 heliogravure reissue of the great c. 1550 Tapisserie Plan or Map of Paris, France. Though quite large, Chardon issued this map at only 1/5 the size the original now lost 1550 map. 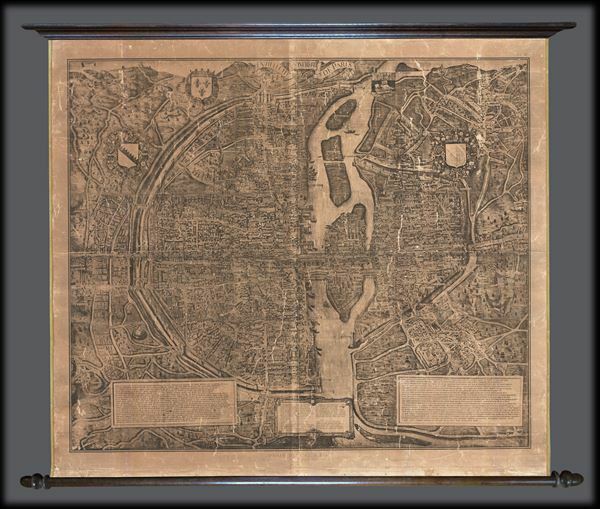 Though the original author is unknown, this monumental production is the second oldest and one of the most strikingly beautiful plans of Paris ever produced. Centered on the Ile de la Cite and oriented to the southeast, the plan reveals the late mediaeval - early Renaissance city in stupendous detail, with each building rendered in profile and in many cases labeled. It is consequently one of the earliest visually correct representations of Paris. Several early structures present on this map still exist today, including, of course, Notre Dame, the Louvre, and St. Severin - others such as the Bastille, do not. As the title suggests the original plan, woven between 1540 and 1550, was a great tapestry presented in a style derived from illuminated manuscripts. By the early 19th century the original tapestry was in tatters but around 1818 a sketch of the tapestry was produced by one H. Mauperche. This sketch was housed at the Louvre's Chalcographie, a department of the Louvre's Cabinet des Dessins, where engravings were (and still are) restruck from their original plates by master printers. Once heliographic printing evolved later in the 19th century, Chardon, a well-established Paris printer and earlier adopter of heliographic technique, was hired to generate intaglio plates, from which this map was printed. The original tapestry is now mysteriously lost after apparently being used as a rug in the entryway to the Hotel de Ville. The heliographic technique used to reproduce it is an early form of photographic intaglio engraving. Close examination of this map will reveal no screen pattern and an incomparably rich palette of blacks and grays. The process is difficult and labor intensive such that each heliogravure is considered an original. Though this map is not dated, the Charles Chardon imprint suggests that it must have been produced in the 1880s. This map was part of a series of Renaissance era plans of Pairs reproduced by Chardon using heliographic technique. Today it is exceedingly scarce. Charles Chardon (1832 - May 24, 1896) was a Paris, France, based printer and publisher active in the late 19th century. The firm was originally founded in 1818 by Chardon the elder on Rue Pierre-Sarrazin. Around 1835 he relocated to Rue Hautefeuille. In 1850 the firm was passed to Francois Chardon, his eldest son, and then in 1862 to Charles Chardon, his younger son. Charles relocated the firm to larger offices at 10, Rue de l'Abbaye. By 1880 Charles Chardon, from his office at 10 Rue de l'Abbaye, was promoting himself as a heliographic engraver - an early photoengraving technique of which he was an early adopter. Possibly because of his heliographic press, Chardon was contracted to produce numerous prints from drawings stored at the Chalcographie of the Louvre. Francois Chardon passed the firm to Charles Wittmann in 1890. Continuing in Chardon's tradition, in 1896 Wittmann become the director of the Louvre's Chalcographie. Good. Professional restoration including fresh linen backing and edging. Some crackling. Original rollers. Bonnardot, A., Etudes Archaelogiques sur les Anciens Plans de Paris, (Paris, 1851), pp. 37-55.